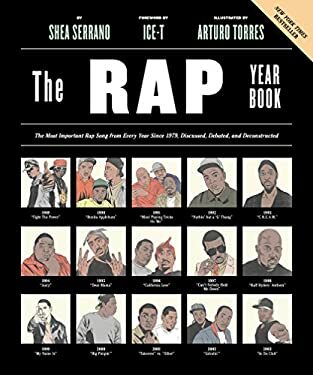 "New York Times" Bestseller "- Washington Post" Bestseller - "Pitchfork" Book Club selection "The Rap Year Book" takes readers on a journey that begins in 1979, widely regarded as the moment rap became recognized as part of the cultural and musical landscape, and comes right up to the present. Shea Serrano deftly pays homage to the most important song of each year. Serrano also examines the most important moments that surround the history and culture of rap music from artists backgrounds to issues of race, the rise of hip-hop, and the struggles among its major players both personal and professional. Covering East Coast and West Coast, famous rapper feuds, chart toppers, and show stoppers, "The Rap Year Book" is an in-depth look at the most influential genre of music to come out of the last generation. Complete with infographics, lyric maps, hilarious and informative footnotes, portraits of the artists, and short essays by other prominent music writers, "The Rap Year Book" is both a narrative and illustrated guide to the most iconic and influential rap songs ever created. "